Add the chocolate, butter and sugar into the boiling water and stir to form a smooth ganache. Pour the ganache over the dry ingredients mixing well to combine - you a whisk to avoid lumps. Add the eggs one at a time until they are blended into the mixture then add in the Rum/Whiskey. Pour the mixture into a lined and greased cake tin until three quarters full. Bake at 160degrees for 30-35minutes until a cake skewer comes out clean. Leave to cool in tin. Once removed from tin leave to cool on a wire rack until it is time to decorate. Stir the sugar and glucose into the boiled cream. Mix the chocolate into the pan and remove from the heat - stir until all of the ingredients are combined. Add the butter at the end when the ingredients are fully combined and the mixture is away from the heat of the stove top. Pour the ganache into a container and chill in the fridge until it is ready for masking (this usually takes an hour or two). 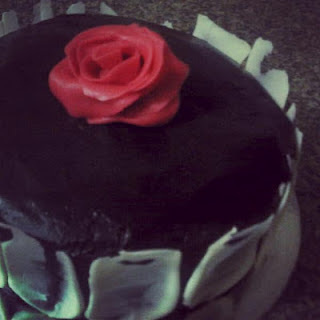 When the cake is cooled use the ganache to mask the cake and then decorate as you please. I included white chocolate highlights and a marzipan rose as additional decorations but you could also keep it simple with chocolate sprinkles or simply leave masked with ganache.